I had a discussion with a colleague of mine last week (yeah, the germaphobic guy) about Twitter. A mutual friend had just started to Tweet about business stuff and we’re both following him. I commented to my colleague that I now follow three people on Twitter. The other two are Redskins tight end Chris Cooley and Newt Gingrich. This morning, my colleague sent me a Tweet he had gotten from a comedian named Sarah Silverman that read, “As I write this I’m in an unmoving airport security line standing completely still in a stranger’s fart.” And, he added, “the only thing that would have made it more funny is if it had been Newt Gingrich.” To which I replied, “what, the Tweet or the fart?” He replied to that with “you must be feeling better, your sense of humor is back.” (See yesterday’s blog about my near-death experience with the flu and see https://brucecrobertson.com/2010/09/21/farts-are-funny/ as proof that fart comments demonstrate a return of one’s sense of humor). I might also add that the return of my immaturity may also be a positive sign in my ongoing recovery from this awful disease. So, to that, let me add….my lunch. Before doing so, let me swear before my God and Creator (and Chris Cooley and Newt Gingrich) that what I’m about to tell you, except for the mustard, was totally and completely random. I’m still home sick so I just went in to make a ham and swiss sandwich (appetite back – another good sign that I may survive). 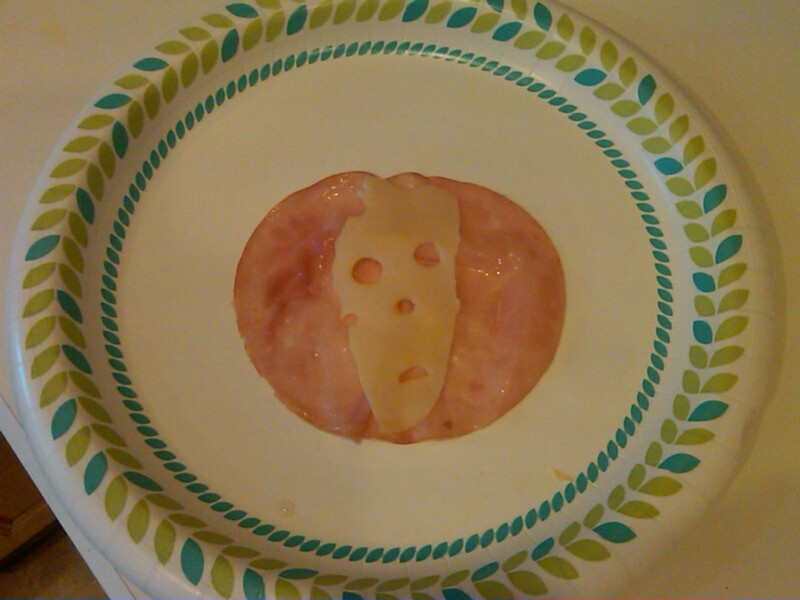 I put a slice of ham on the bread and ripped off half a piece of swiss cheese and tossed it on top of the ham. I looked down and saw this staring back up at me. I found this particularly entertaining and quickly named him Ham and Cheeseman (I know, not very original, but I was on a tight timeline). 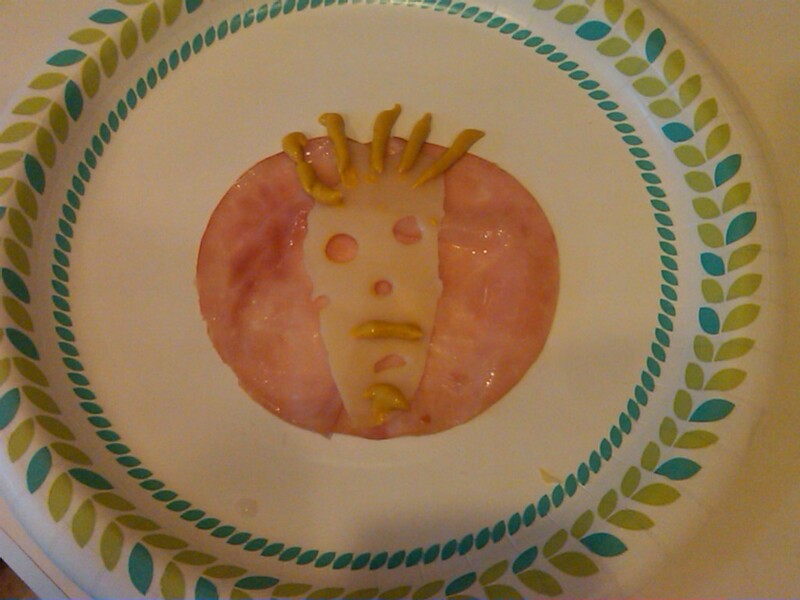 But, I also very quickly realized Ham and Cheeseman was missing something. 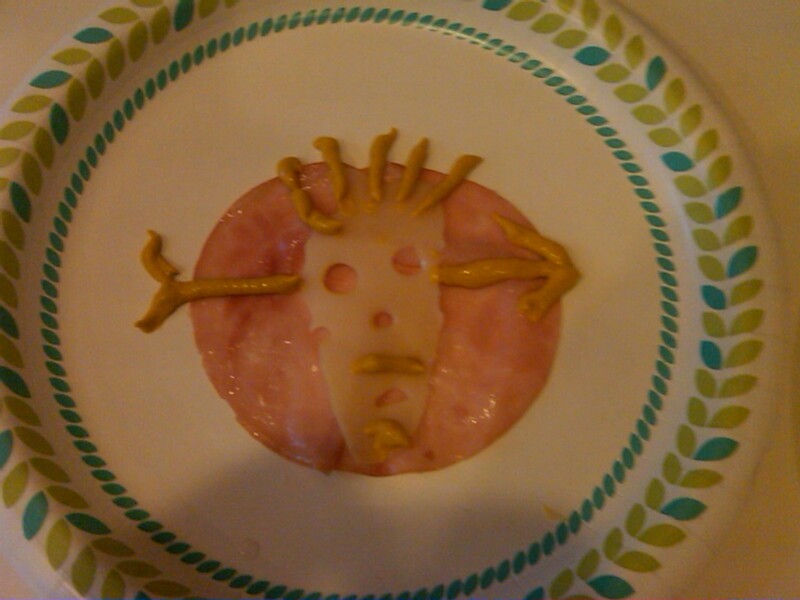 I grabbed the mustard and gave him hair and a goatee. Ham and Cheeseman gets hair and a beard! I was hoping the hair and beard would make Ham and Cheeseman look a little less menacing, but instead it made him look like one of those deadly headhunters on Gilligan’s Island (btw, how the hell did the headhunters get on the island?). Sadly, that made me realize I had to euthanize Ham and Cheeseman. Since he most resembled the headhunter on Gilligan’s Island, I decided to off him with one of those handmade spears Gilligan and the Skipper carried around for protection. I’ll miss you, Ham and Cheeseman. I feel like I was just getting to know you. That said, you tasted good.